New School Year... | People for People, Inc. Thank you for your support. As we are well into a new school year I wanted to update you on what your support has accomplished. While students were away for the summer, our high school has been consolidated into our “bank building” requiring workers to move equipment and supplies along with remodeling costs and HVAC systems. Because of your ongoing support for my vision here in Philadelphia, we will celebrate the first senior high graduating class in 2019. 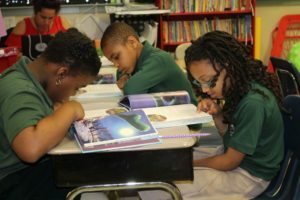 For almost two decades, People for People Charter School has provided a rigorous academic program, anchored in the fundamentals of entrepreneurship, character development, and community engagement, to hundreds of primarily low-income students from throughout North Philadelphia. In order to prepare these graduates, we have established a College and Career Readiness Center, which includes individualized support and coaching as they prepare their lives for post-graduation. Under the four-year plan, students have the opportunity to partner with community organizations for a service learning experience, participate in a paid summer internship program, enroll in an ACT Exam prep course, visit college and universities, and participate in workshops designed to help families navigate the college application and financial aid process. I share great pride in our strong, close-knit community of students, families and educators and I’m especially proud that most of our 12th graders have been with us since elementary school. I consider you as part of this community and depend upon your support for many of the needs surrounding the development of PFPCS. Follow us on Facebook to see currents events and what your gift helps to accomplish at PFP.